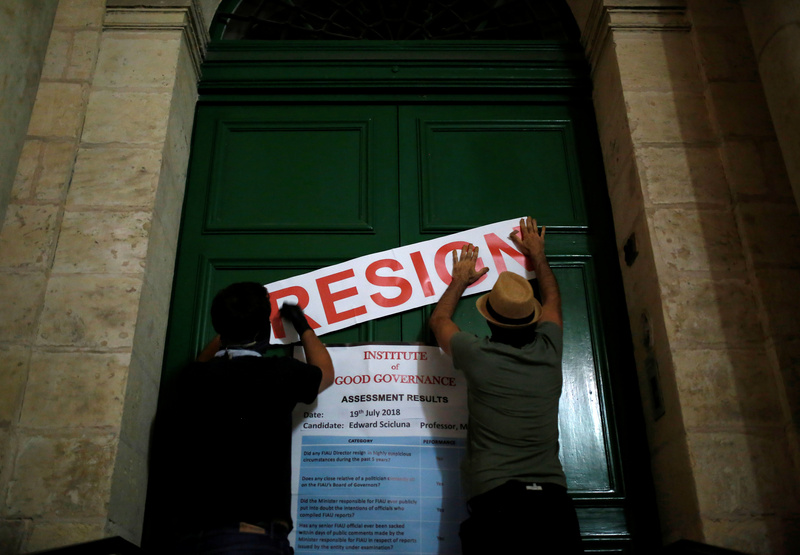 Activists from non-violent action group Rezistenza Malta hang banners calling on Finance Minister Edward Scicluna to resign after the European Banking Authority found "general and systematic shortcomings" in Malta's application of EU anti-money laundering rules, at the Ministry of Finance in Valletta, Malta July 20, 2018. New rules designed to tackle money laundering in the European Union have been criticised by senior EU bank supervisors for not being tough enough, a person familiar with discussions told Reuters Breakingviews. The fifth review of the EU anti-money laundering directive became binding in July after alleged wrongdoing at banks in the Baltic states and Malta, according to a Reuters news report on July 9. The rules seek to strengthen controls on the real owners of companies and digital payments, including virtual currencies, in part by requiring member states to establish centralised bank account registers to smooth the work of security forces. But there are worries that national “financial intelligence units” remain weak and rarely cooperate, making it easier for criminals to get away with laundering illegal proceeds when they transfer them across borders. The European Central Bank’s top supervisor, Daniele Nouy, has previously said EU rules do not give supervisors clear powers to revoke banking licences over alleged money laundering, or force the removal of bank board members if they do not pass a “fit and proper” assessment.